A diverse Anglo-Catholic community in the centre of Melbourne, Australia. Growing in God’s love. Lord of all life and power, who, through the mighty resurrection of your Son, overcame the old order of sin and death to make all things new in him: grant that we, being dead to sin and alive to you in Jesus Christ, may reign with him in glory; to whom with you and the Holy Spirit be praise, honour and thanksgiving, now and for all eternity. Amen. Our monthly service of Evensong followed by Benediction of the Blessed Sacrament. Beloved anthems by Purcell, Stabat Mater by D. Scarlatti and Charpentier's soaring Mass for Four Choirs. Our annual inter-parish service of thanksgiving for the Blessed Sacrament. Our 2019 celebration features Fr Rod Bower as preacher and Bishop John Parkes as presiding bishop. We are an inclusive Church built on the traditional lands of the Wurundjeri people. We are committed to social justice and diversity. Our mission is Catholic evangelism: "Growing in God's Love". The St Peter’s book room is a ministry within St Peter’s Eastern Hill, Melbourne; a place of social outreach, book selling and welcome for the public. We sell not only books but also gifts, devotional items, and church supplies. The St Peter's Eastern Hill Melbourne Charitable Foundation is a not-for-profit charity that supports the activities of St Peter's insofar as they relate to the benefit and support of people in necessitous circumstances. The Foundation primarily carries out the former, by supporting the outreach activities of the Anglicare 'Lazarus Centre' program hosted at St Peter's Eastern Hill Church. Established in the 1850s, the choir of St Peter's Eastern Hill is one the oldest Anglican church choirs in Melbourne. It upholds an enviable and unique tradition of fine sacred choral music. The Cell of Our Lady of Walsingham at St Peter's is associated with the Society of the Holy House of Our Lady of Walsingham in Norfolk, England. 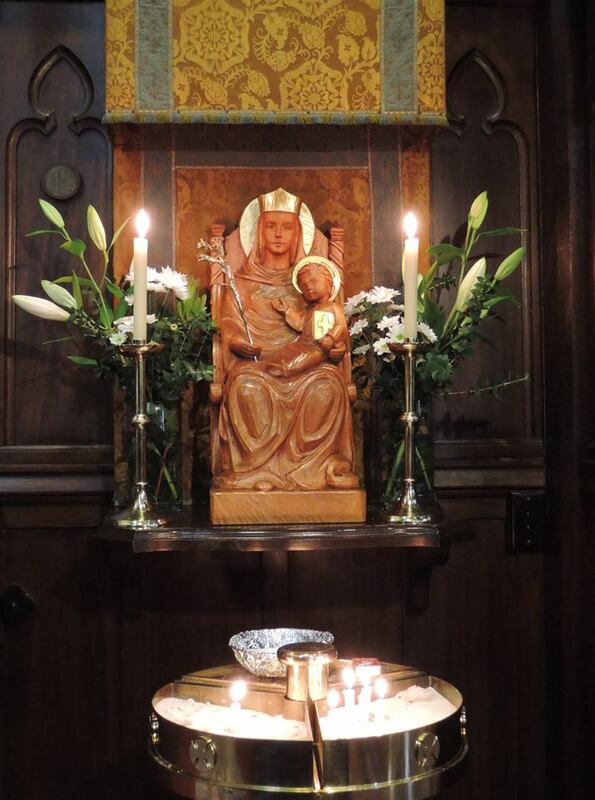 In 1061 the Lady Richeldis, the Saxon Lady of the Manor of Walsingham, had a vision of the Blessed Virgin Mary. As a result of this vision, she had built a replica of the House of the Holy Family at Nazareth. At the site of the house in Walsingham there was also a Holy Well. The shrine became known as England's Nazareth and became a major place of pilgrimage for 500 years, second only to Canterbury. Augustinians and Franciscans established a priory church. In 1538, during the reign of Henry VIII, the shrine was destroyed and for the next 400 years Walsingham reverted to quiet village life.